The Macintosh’s first game was called “Through the Looking Glass.” Sometimes referred to as “Alice,” It featured pieces that looked like characters from the Lewis Carroll story. The game has made its return on the iPhone in the form of AliceX. Capture board pieces as Alice. 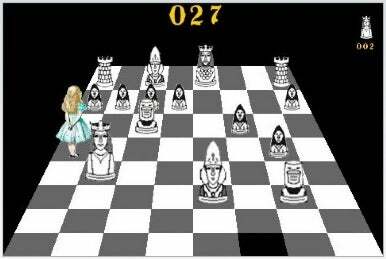 The concept of AliceX is to maneuver Alice around a board filled with chess pieces. This isn’t a strict game of chess, though. The goal is to help Alice capture all the pieces on the board. Alice plays with the capabilities of one of the chess pieces, starting out as the queen and eventually at higher levels restricted to the moves only a pawn can make. AliceX features 96 levels in four speed groups; there are also different piece designs, including “Classic” Alice pieces, “Hip Hop” pieces and “Bush Memorial” pieces.